Rom: Spaceknight, published by Marvel Comics, 32 pages. 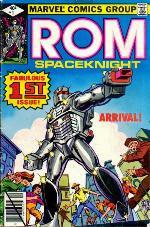 As an 11-year-old child, discovering Rom: Spaceknight was just more icing on the cake that was the world of comics. The exciting concept of a heroic alien, stationed on our planet to wipe out an evil alien race living right under our noses? C’mon! You expect any red- blooded boy to pass that up? There is some solid characterization there, however, thanks to Bill Mantlo, who wrote the entire series, Annuals included. Though a bit black and white, there is still room for heroes that are true-blue, and villains that are..., well, truly villainous. That was Rom and the evil “Dire Wraiths”, respectively. Nearly every issue of Rom was an action-filled page turner, with little time for readers to catch their breath. And, with the premise that practically anyone could be a Wraith, there were ample twists and turns along the way. Rom: Spaceknight is recommended for all ages. Find it at comics shops and online retailers and auctions. Prices vary.